With nuclear power generation expected to increase over the coming decades to meet the increasing global energy demand, access to this unconventional reserve is a matter of energy security. Reserves of such non-renewable raw materials are often limited to a few countries. Uranium is one such “critical metal” and as estimated by the International Atomic Energy Agency (IAEA), the total identified conventional resources can only last for about a century. However, it is estimated that there is an astonishing 4 billion metric tons of uranium dissolved in the Earth’s oceans at a concentration of 3.3 ppb, which is approximately 1000 times more than is available from terrestrial ores, affording a near limitless supply of uranium. With this knowledge, technology development capable of sequestering uranium from seawater in an economic manner would afford a financial backstop, ensure resource accessibility to nations devoid of uranium reserves, and impede any dramatic fluctuations in the uranium supply chain. 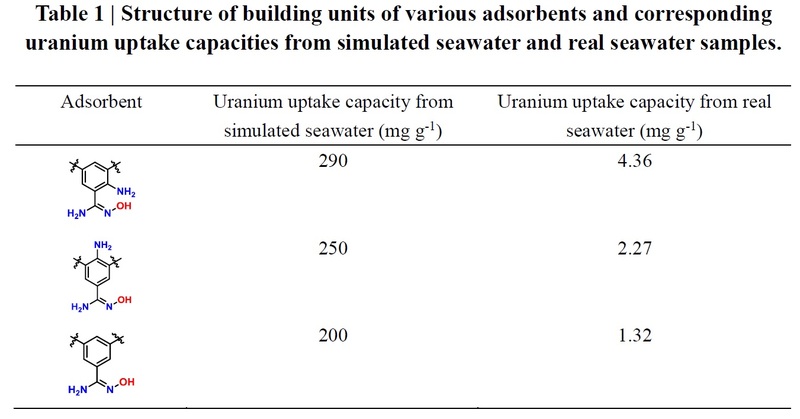 Given the extreme complexity and vast volume of seawater, as well as very low concentration of uranium in it, to attain this ambitious task demands the design of adsorbents with high affinity and fast kinetics. 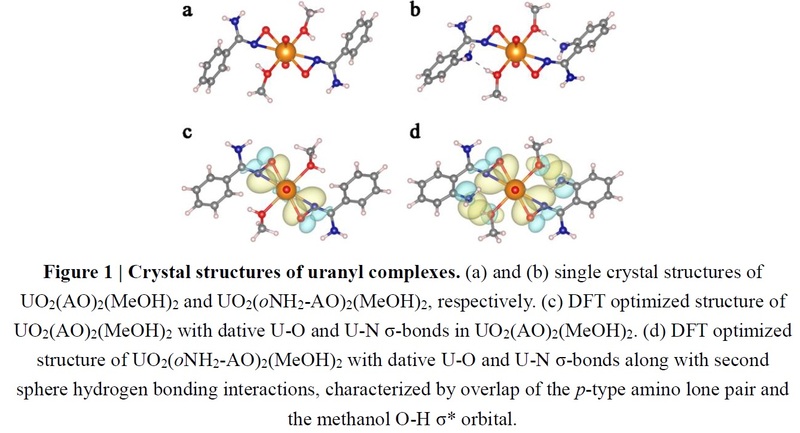 To enhance the affinity of chelating groups to uranyl ions without complicated ligand design, we were inspired by nature, where the affinity of amino acids involved in binding ions can be greatly enhanced by non-covalent interactions from the surrounding amino acids in the protein scaffold and even achieve femtomolar affinity. With this in mind, we reasoned that the binding affinity of chelating sites towards specific ions can be improved by introducing an assistant group orientated in a suitable position. Given their cost effective synthesis, amidoxime polymers have been identified as the most promising platform for large-scale extraction of uranium species from seawater. Amidoxime typically has a low affinity and poor selectivity for uranyl in seawater conditions, however, as it binds nickel, cobalt and iron present with greater affinity. To this end, we decided to introduce an assistant group to reinforce the coordinative binding between amidoxime and uranyl. Considering the importance of spatial distribution to enhance their mutual cooperation, monomers containing an amino substituent with hydrogen bonding and electron donating capabilities in different positions relative to amidoxime were designed. Furthermore, these monomers were built into high surface area materials to conserve a sufficiently high density of chelating groups in the resultant adsorbents for achieving high uptake capacities (Table 1). (Figure 1). This proof-of-concept study is important because it affords an amenable route to bridge natural and artificial systems. Moreover, this strategy is practically feasible and thus provides a new direction towards the development of adsorbents for uranium capture.